The launch of the European Union Brand Centre is already attracting world media attention. As part of the media campaign leading up the full launch of the centre, Gold Mercury President and Brand EU Centre Founder Nicolas De Santis has been appearing on live television interviews to discuss the European Union’s branding problem, and why it so desperately needs a dedicated centre to manage its brand. Gold Mercury have recently launched the BRAND EU™ Centre: a pro-EU, independent initiative designed to reposition the European Union’s poorly communicated “brand image” and clarify its future vision. It will also deliver critical analysis and insights on the current state of the EU’s identity and provide solutions for increased citizen involvement and improved EU governance. De Santis was interviewed by Richard Quest of CNN on “Quest Means Business,” concerning the current identity and branding crisis which the European Union is suffering. During the interview, they discussed the “shambolic” situation with regards to how the EU connects with its citizens and how the EU has safeguarded peace in Europe for 50 years now. 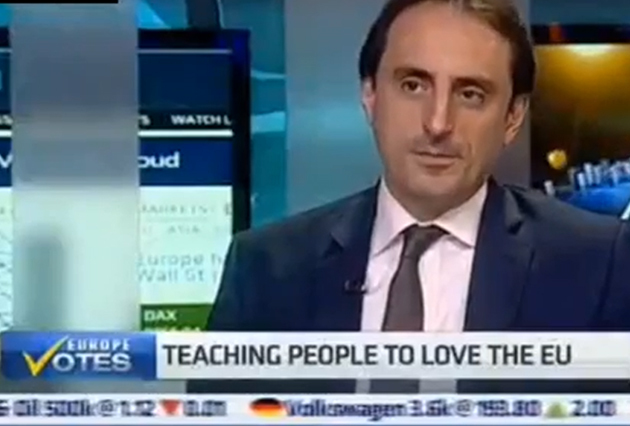 De Santis was also interviewed by leading anchors Ross Westgate and Louisa Bojesen on CNBC. During the interview, De Santis talked about the branding problem of Europe and why focusing on helping citizens connect with the European brand is so important for the future of the EU and of European peace and stability. Over the course of the discussion it was noted how the typical discourse surrounding the EU tends to focus on the negatives (and/or how the negatives are avoided and mitigated by the EU in the pro-European forum), rather than the actual positives the EU brings to its citizens, such as its current moves to abolish roaming charges across the EU. To learn more about the media interviews, watch the CNN and CNBC Videos above. To learn more about the Brand EU Center, please visit the following link. Gold Mercury’s President also spoke on Al Jazeera and RT. On Al Jazeera he talked about the outcome of the European elections and how it is a reflection on the recent Eurosceptic discourse and the growing need to solidify a strong brand and identity to help keep Europe together. RT (Russian Television) conducted an interview at Gold Mercury and BRAND EU Headquarters in Mayfair London, where Polly Boiko, RT Correspondent, looked into BRAND EU’s recent poster campaigns and their potential impact on driving home both humorous and serious/emotional messages about the EU to citizens.